This man did not seem to mind being escorted by this policeman into the Old Hope Road offices of the Commissioner of Police. He was taken into custody after he was seen hanging from the door of a bus as it passed the Commissioner's office recently. Caption: Heh, heh, a ketch him ketch mi wid im girl. Caption: Smile squaddie, yuh nuh see we deh pon 'Candid Camera'. Caption: Ah joke him a joke wid me man! Caption: Boss, I go peacefully but please don't give me a wedgie! 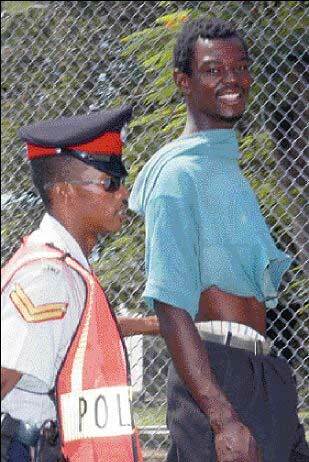 Caption: Officer: "come my yute, mi show yuh how fi put on yuh shirt one more time." Caption: Time to round up the ususal suspects! Thank you for the 140 responses we received. Enter again and we hope you will be the outright winner next time.